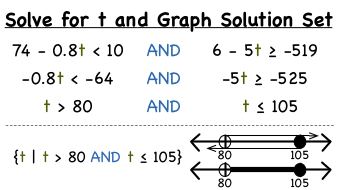 How Do You Solve an AND Compound Inequality and Graph It On a Number Line? Trying to solve a compound inequality? No sweat! This tutorial will take you through the process of solving the inequality. Then you'll see how to write the answer in set builder notation and graph it on a number line. You'll see it all in this tutorial! How Do You Graph the Intersection of Two Inequalities? Number lines help make graphing the intersection of two inequalities a breeze! This tutorial shows you how to graph two inequalities on the same number line and then find the intersection. Take a look! How Do You Solve an Inequality with Negative Numbers Using Division? Wondering what a compound inequality is? Then check out this tutorial! You'll learn the definition for a compound inequality and also see how it can be written in set builder notation. Take a look! How Do You Solve a Word Problem Using an AND Absolute Value Inequality? Word problems allow you to see math in action! This tutorial shows you how to translate a word problem to an absolute value inequality. Then see how to solve for the answer, write it in set builder notation, and graph it on a number line. Learn all about it in this tutorial! How Do You Solve an AND Absolute Value Inequality and Graph It On a Number Line? Trying to solve an absolute value inequality? No sweat! This tutorial will take you through the process of solving the inequality. Then you'll see how to write the answer in set builder notation and graph it on a number line. You'll see it all in this tutorial!